It started out as a typical Sunday. Shoppers crowded into Osaka's Shinsaibashi, one of the city's fashionable shopping and entertainment districts. By midday, it erupted into horror. A thirty-six year-old man (above, in stripes) went on a stabbing rampage that left two dead: 66 year-old female Toshi Sasaki, a bar manager, and 42 year-old Shingo Minamino, a music producer for a video game company. Minamino grew up in Osaka, but moved to Tokyo to work in the music industry and for game company NitroPlus. While at NitroPlus, Minamino created music for many of the game label's acts, such as virtual idol Super Sonico and oversaw Georide, NitroPlus' music label. The music producer was in Osaka this weekend for a Georide fifth anniversary concert. 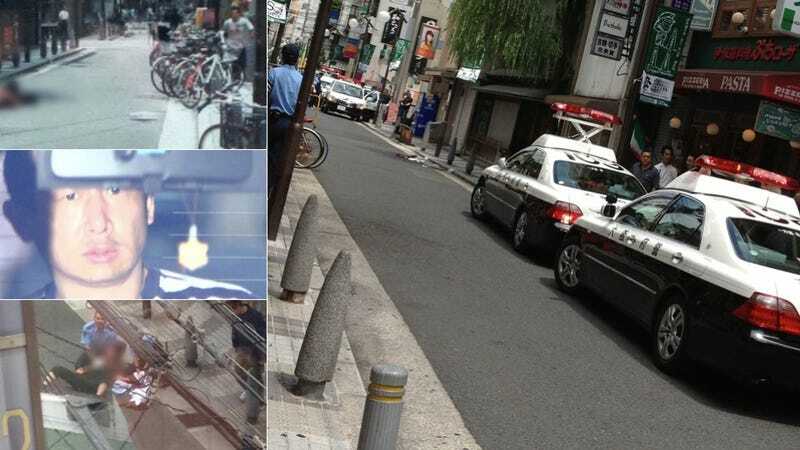 On Sunday afternoon, he was walking near the venue when Kyozo Isohi, 36, suddently approached and repeatedly stabbed him 30 to 40 times with an 18-cm kitchen knife. According to The Mainichi, an onlooker described Isohi as looking like "as if he was haunted by something." Minamino screamed for help. Eyewitnesses watched on in horror—or photographed the scene with their smartphones. Others screamed in terror. Searching for a new victim, Isohi then walked down the street and began slashing Sasaki, who was riding a bicycle. Yomiuri reports that onlookers called out to her, telling her to escape, but she apparently didn't realize what was happening until it was too late. After attacking her, Isohi returned to stab Minamino again, even as the police told him to stop. According to TV news reports, some onlookers thought this was a fistfight, which are common in this area, and didn't try to break it up. Others saw the knife and backed off. "I was going to kill myself and bought a kitchen knife to the scene. But I stopped short of killing myself. I thought I would be sentenced to death if I killed someone," Isohi told authorities. "I thought I would be sentenced to death if I killed someone." Isohi, who was recently released from Niigata Prison in May, said he did not know the woman or Minamino, adding, "It made no difference to me." Reports state that Isohi previously lived in Tochigi Prefecture, was a member of a biker gang, and had money problems. "He was arrested for drugs a number of times," one insider told Sponichi Annex. The attack brings back horrible memories of the 2008 Akihabara Massacre in which Tomohiro Kato, then 25, drove a rented truck into a crowd in Tokyo's geek district. That attack, which resulted in seven deaths, was also on a Sunday—a horrible, horrible Sunday. Kato was sentenced to death. If Isohi gets his wish, he will, too. NitroPlus issued a statement confirming that the Shingo Minamino who was savagely murdered was the same Shingo Minamino who worked with the Tokyo game company, adding, "We hope that he rests in peace, and we offer our deepest condolences to his family."